The musical play showing at the Newmark Theatre is another fine example of the talents of Marv Ross. Marv and Rindy Ross have been in the Portland music scene for some time now. In the early 80′s I can recall seeing them perform as Seafood Mama. I wish I still had the VCR tape of a concert I recored off my old black and white TV. Then, on to fame and fortune as the group Quarterflash. Once I get my record player working again, I could play their tunes from my vinyl LP. As of late their time has been spent with the very talented group of musicians known as the Trail Band. If you have seen this group you have then marveled at how widely musically talented they all are. And, if you haven t seen them, then you perhaps you could catch them at one of their shows. One of our Christmas season rituals is to see them in one of their Christmas shows at the Aladdin theater. Marv has served as the musical director for Cycle Oregon, so we have had the opportunity to see him many times during the nightly musical performances during the bike tour. There, on different occasions, he has performed, solo, with the Trail Band, and in a Quarterflash reunion. So, we have heard him talk about his work in writing “The Ghosts of Celilo” for many years. When the tickets went on sale, we knew we had to go. Last night we saw the show and were real impressed. The acting performances throughout were outstanding, the sets, music and voices were all outstanding. It covered a very difficult subject with just the right emotions, without being heavy handed. We enjoyed the evening immensely, the work put out by the Artists Repertory Theatre is always good, and recommend it to everyone we know. The musicians of course are top notch. Most of them are made up of the afore mentioned Trail Band, as well as Karen Kitchen a truly gifted Indian vocalist from the Osage nation of Oklahoma. A real treat for anyone interested in the history of the Indians in Oregon. This entry was posted in Social on September 30, 2007 by golinielcomblog. Using compact flourecent bulbs on our porch. Ok, we sometimes leave our porchlights on all night. Of course extended use of lighting can use lots of power, and somewhere there is room for a some savings of energy and dollars. That is where the compact fluorescents come in. I am going to try these. They say they can be used outdoors. And, they are smaller than the others we have, so they fit into the enclosed porch fixtures nicely. Plus they are boasting some sort promises of 5 year replacement warranty. We will see how long they last. It is not likely I am going to go to the trouble and expense to package and mail one off to get a replacement when it goes out, but I do appreciate the sentiment. Its a 60 watt bulb that uses 13 watts, and again with their promises, they claim the bulbs use 70% less power and will save me a whopping $68.00 over that 5 year expected lifetime. What puzzles me, is if my energy/resource savings are going to outweigh the energy/resources used to package them up in all that plastic in the first place. This entry was posted in Social on September 28, 2007 by golinielcomblog. My son sent me the the link to this Shirt. – Infinity Miles Per Gallon. 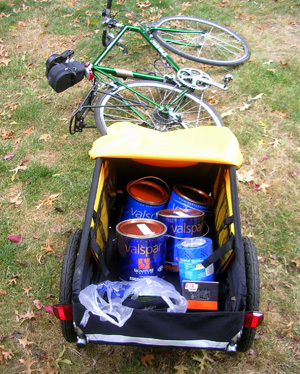 This entry was posted in Bicycling & Fitness on September 18, 2007 by golinielcomblog. GoLiniel gets a photo published! Back in August I wrote of our bike ride along the Springwater trail, through Oaks Bottom. At the time, the tall grasses of the lowlands were being burned to control wildfire. We took a few shots and put them on our blog. Soon after that we were contacted by the Portland Parks department, asking if they could use our photo in their website. Of course you can! Take it, use it. Thanks. This entry was posted in Portland, Or, Oregon on September 17, 2007 by golinielcomblog. 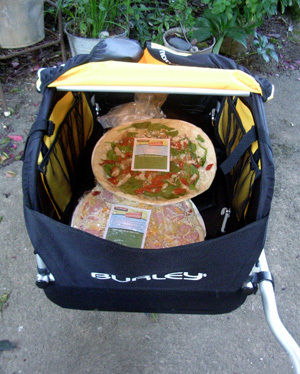 Our “What can we carry in a Burley?” game. Our first cargo was hauling a watermelon to a 4th of July barbecue. We did not get a photo of that, and the ever helpful Honey is encouraging me to carry another so that we can get photographic proof. Since then the game has progressed. First pizza…. then, on another hot day, beer……. 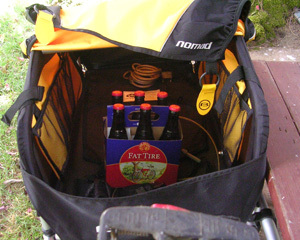 This entry was posted in Bicycling & Fitness on September 16, 2007 by golinielcomblog. Bike to the Future is about so much more than just going for a ride: it is an opportunity for in-depth exploration of some of Portland’s most innovative sustainability projects. And because of the ride’s interactive elements, flat course and support along the way, this event is a great one to entice your friends and family who don’t ride very often. Come on, summer is almost over – make sure those sometimes-riders get out on their bikes! You’ll start the morning with pedal-powered fruit smoothies at Sunnyside Environmental School, where student volunteers will use their boundless energy to whip up a refreshing peach and yogurt treat especially for you. After a 28-mile ride on low-traffic streets with three destination rest stops, the course will guide you back to the school for lunch with Laughing Planet. Be a part of the future that is happening now. Bike to the Future. The Peach of a Century. The ride includes a full century and a metric century. Both routes start and end at Chemeketa Community College. The 100-mile is a nice route goes through Jefferson, Roaring River, Mehama and Stayton. The 62-mile route is generally flat and passes through Jefferson and Stayton. There are three rest stops on the 100-mile route and two on the 62-mile route. All rest stops are stocked with food, water, sports drink and provide restrooms. Honey promised me it was a flat century. Well, its not flat, hardly any centuries in Oregon are flat. But for an Oregon century, I will admit it is flatter than most. Its a great ride, pretty route, and usually surprising good weather. The Salem Bike Club is well known for their solidly organized rides with well planned courses, but if that’s not reason enough to sign up, then surely the famous finish line peach pie should get you on your bike. This entry was posted in Bicycling & Fitness on September 13, 2007 by golinielcomblog. 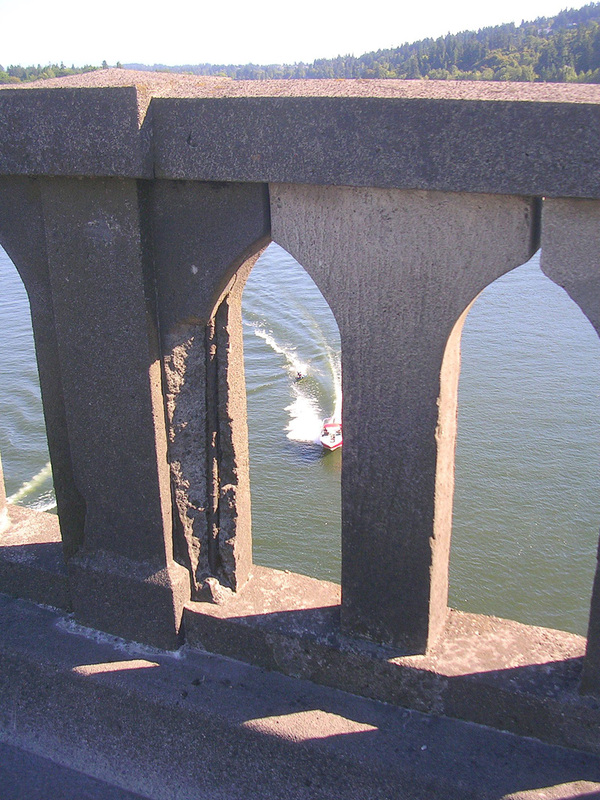 On Sunday, Sept 9th, the Sellwood bridge was closed all day, for maintenance. Hearing that, I knew I had to ride the bike down here to see what was going on. Sure enough, it was closed. Closed to cars, but not to bikes! There seemed to be a stream of bicyclists crossing the bridge. We rode up back and forth. On the road! On both sides! What a great ride that was. A much better car free bike/bridge experience than even the Bridge Pedal can provide. 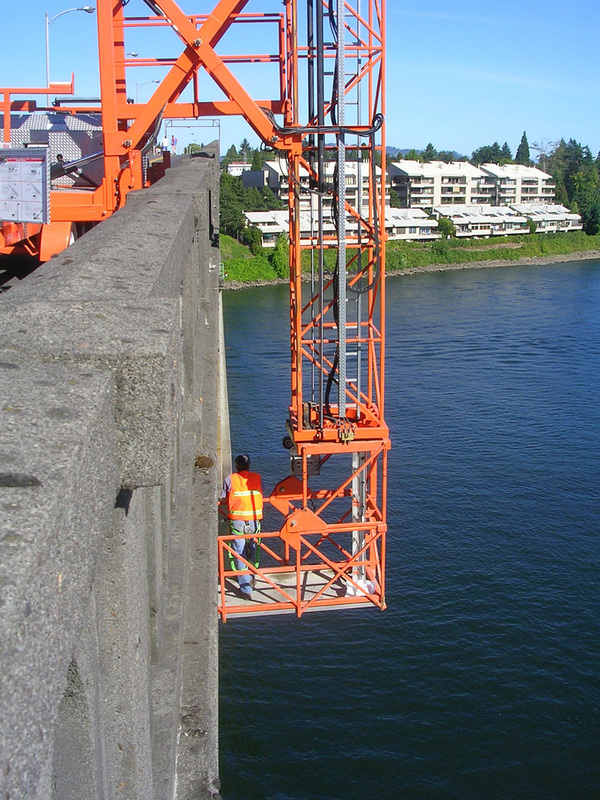 In fact, building a new bridge, while keeping the original Sellwood as it is for bicyclists and pedestrians is one of the options being considered for the Sellwood Bridge replacement. And while that sounds like a very nice option , in reality that option may turn out to the be worst option for riders in the long run since that span will surely receive little or no maintenance or funding in the long run, and with that, the new bridge will then be built with minimal bicycle access, which could mean we would be worse off then than we are now. The BTA also does not support this option. But anyway, it was really nice to be able to ride the bridge and admire the sunny views without the noise, danger and aggression that usually accompanies this bridge crossing. 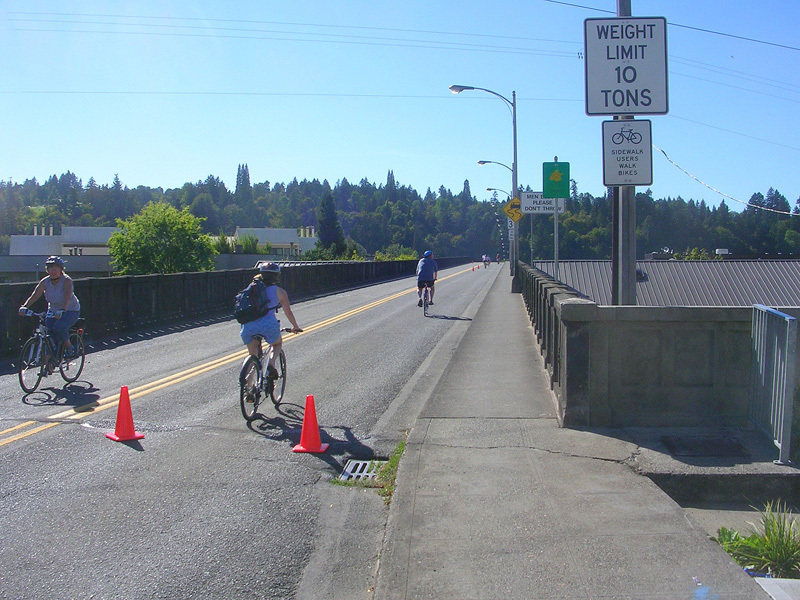 Bikers had a carefree carfree ride across the Sellwood bridge. They did stuff like patch up deteriorating joints. 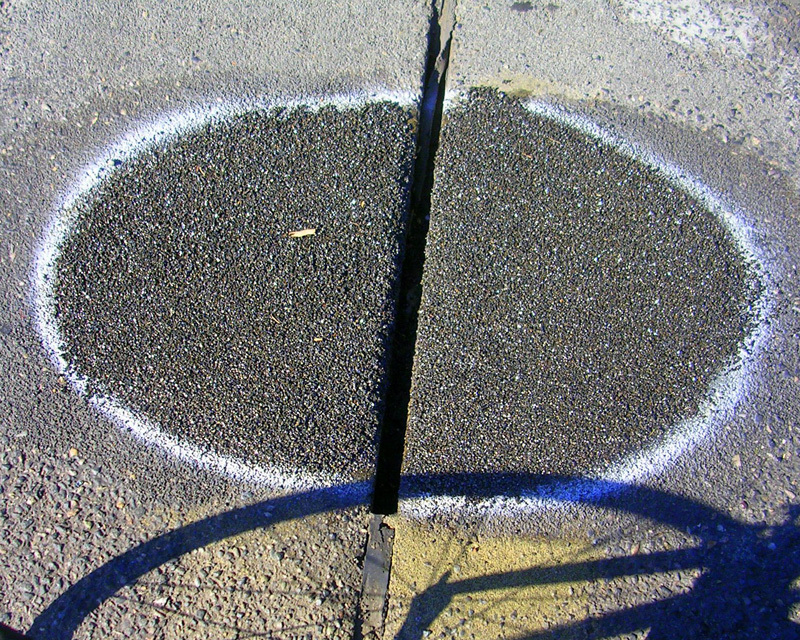 This entry was posted in Bicycling & Fitness, Spanning the Bridges on September 11, 2007 by golinielcomblog. 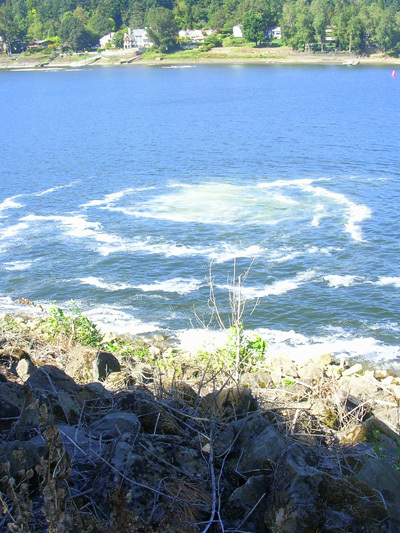 While biking through the Milwaukie Riverfront park Saturday, we stopped to look at a boiling water spot just off-shore of the Willamette. “What could that be?” Honey wonders. My first though was explain it away as some natural phenomenon like that those occurring in Green Peter reservoir. but those thoughts were quickly dismissed when I realized exactly where were were. We were standing in a spot directly between the river and the Kellogg Creek Waste Water plant. “One more reason not to swim in the river” says Honey. Well, this is sad but true I think. It is an unfortunate necessity, and all this waste water we create does have to go somewhere, but it is just more discouraging if we can actually see the results of the ugliness we create. And it is not that this is a secret. They do have a permit for discharging this into the river. But there is also plans to make changes. Lets hope some of these alternatives that are being considered by the Clackamas County Service District will not only make economic sense, but can serve to improve our local ecology as well. This entry was posted in Portland, Or, Oregon, Social on September 9, 2007 by golinielcomblog. Our Dog Jack is NOT a Happy Puppy Now. He seems to have gotten over that ok, and that is not why he is unhappy now. He is unhappy now because he is forced to wear THE COLLAR! 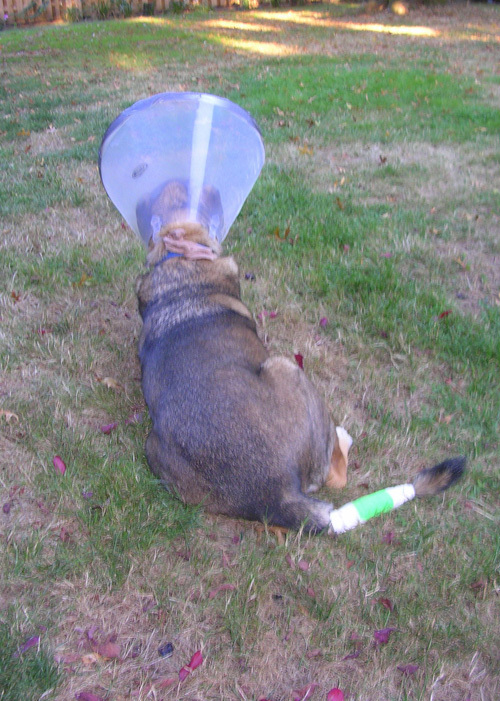 While his tail is healing he cannot be allowed to lick or chew or otherwise mess with it himself. He just does not like it! He hasn’t figured out how to walk with it, and he catches it on everything. Knocking down trash cans, and chairs and anything else that may be in his general path. For a dog that likes to walk very close the the edges and borders of things, he now has to figure out some way to swing wide of all obstacles. It droops just enough to catch on the bottoms of the stair steps, so he has found it nearly impossible to climb stairs without assistance. He isn’t allowed outside without parental supervision. 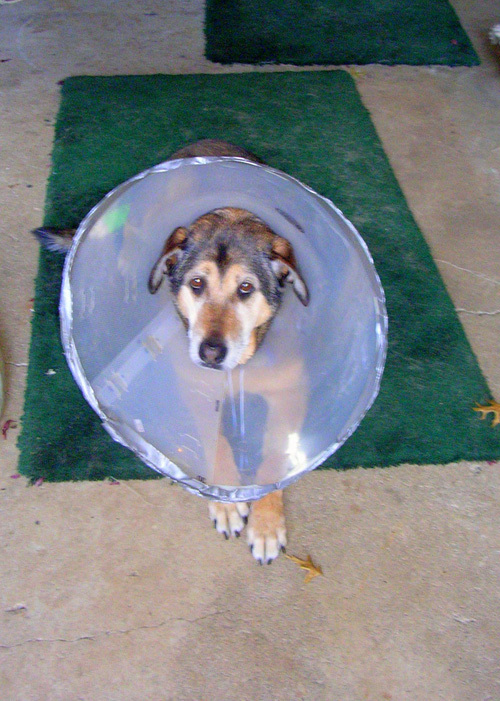 It is day 2 of “The Collar” and he has taken to whining now, as a plea for an explanation as to just what he has done wrong to suffer such punishment. 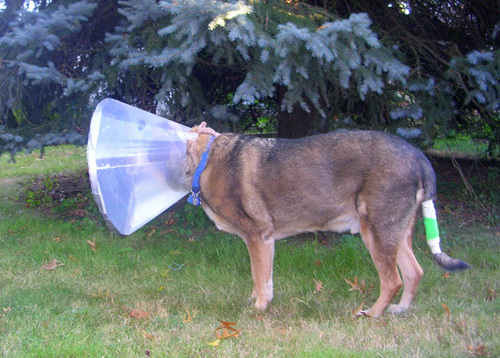 Unfortunately all we can do is sympathize with him and give him plenty of face scratching since he can’t to that himself either. If he could just understand English we could tell him that he only has to wear it for 12 more days! Click Here For Jack related photos when he was much happier. This entry was posted in Social on September 7, 2007 by golinielcomblog.